The Seminar our Group enRICHen recently hosted, owes its success to many people. To begin with, HIGH FIVES is the title of the Book I'll begin writing soon. It's about the 5 key Influences that determine what a person's present is and future will be. Mind Mapping Seminar a few months ago. http://www.mindmapstrainer.com/mind-map-trainer He referred to it as the 'Eureka Moment' that occurs as a result of the Training!!'. In an instant out of nowhere I could see the threads of the contents of the Book, its name and feel! The excitement was palpable and I knew there was something about writing that got me involved fully. Meanwhile my Group, enRICHen, was organising the first of a series of Seminars on the 7th of of July. Somehow, the speakers to address it just were not fitting the bill for some reason or the other. I had always toyed with the idea of using the HIGH FIVES principles to train people after the book would be published. I had discussed this thought with my friend Yogesh http://www.workshops.co.in/ who saw a successful Public Speaker in me. Yogesh incidentally has played a key role in my career switch to a Communicator: he helped set up my BLOG, the enRICHen website http://www.enrichen.co.in/ and guided me with his immense knowledge of the Social Media. With the venue booked, the Audio-Visual team in place, I thought of inviting Dr.Chandrashekhar Ranade, a long time Mentor on Facebbok through his group Guru L-Earning Systems https://www.facebook.com/cranade1. He graciously consented to travel all the way from Ahemedabad to deliver a Key closing Presentation at HIGH FIVES on The Power of the Mind. A last minute inspiration made me request Mr,Chaudhary, a Spiritualist, Laughter Club leader and conductor of daily Meditation sessions to join us. His 30 minute closing demonstration of the benefits of Meditation cast his spell of magic over us. Although I've been practising this art for over a decade I always appreciate his skill in guiding the uninitiated. My own presentation was based on two Mind Maps with interlinked images that supported them. Certainly, being the very FIRST Public talk by me at such a level, there's always room for improvement. 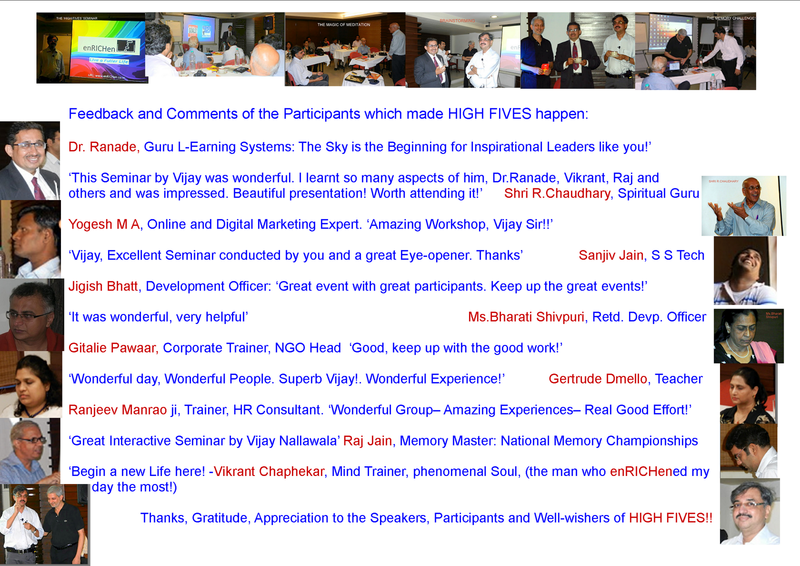 The Seminar was livened by the interaction with the Participants which revealed some startling facets of the persons. This was one of the most Positive, Innovative and GIVING set of people I had met together in one room. It is a source of immense satisfaction that they felt the same, too! Isn't that what matters the most?